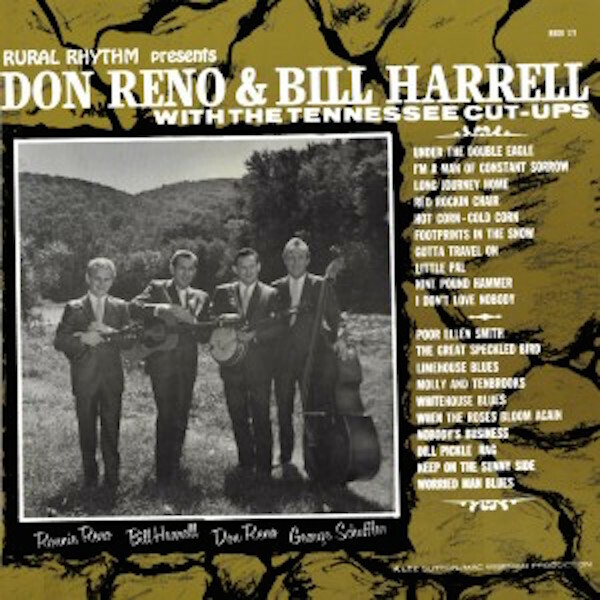 Rural Rhythm Records has announced a new title by Bluegrass legends Don Reno & Bill Harrell in its archival Heritage Collection. Series. This series will help keep traditional roots music alive and preserved for future generations. It includes authentic Old-Time Country, Bluegrass, Folk, Country Waltzes, Fiddle Tunes and Gospel music performed by many legends & pioneers. Titles are mastered from the original master tapes, with original cover artwork and include many albums never-before available on CD. Since the initial release in late 2013, fifteen titles have been released to date in the Rural Rhythm Heritage Collection. Series including titles by Mac Wiseman, Hylo Brown and The Timberliners, Red Smiley and The Blue Grass Cut-Ups, J.E. Mainer & The Mountaineers, Curly Fox, Lee Moore, Raymond Fairchild and Jim Greer and The Mac-O-Chee Valley Folks. Rural Rhythm is now releasing one more title in the Heritage Collection. Series in both the physical CD and digital formats by Don Reno & Bill Harrell with The Tennessee Cut-Ups, originally released in 1966. Considered one of the legends of Bluegrass Music, Don Reno’s superb and unique banjo style and vocals, along with Bill Harrell’s fine guitar pickin’ and singin’, is an overwhelming combination even before you add the solid background performances of Ronnie Reno on mandolin and George Shuffler on bass. This important 60’s Bluegrass collection of 20 classic Bluegrass songs demonstrates the energy, passion and down home fun which has been the signature of Bluegrass music for over seventy years. on the Top 50 APD Bluegrass / Folk Album Chart for December. All the other fifteen titles currently released in the Rural Rhythm Heritage Collection series are available on AirPlay Direct. In addition,Don Reno & Bill Harrell with The Tennessee Cut-Ups (RUR-171) is now available on Amazon, iTunes and wherever digital and physical CD music is sold. Rural Rhythm Records released a long line of Old-Time Country, Bluegrass & Gospel albums during the label’s first two decades after Uncle Jim O’Neal started the label in 1955. Many of these vintage classic albums are still in Rural Rhythm’s active catalog available on CD and digital formats. Many songs are still available in the various artist collection titles found in the Sound Tradition series. Many tracks were previously released only on vinyl records and will come back to life through the Rural Rhythm Heritage Collection Series. Many legends and pioneers released albums during this period including Mac Wiseman, Hylo Brown, Don Reno & Bill Harrell, Red Smiley, Jim Eanes, Vassar Clements, J.E. Mainer, Earl Taylor & Jim McCall, Raymond Fairchild and many more. Bringing the traditional “retro” vintage sounds from the past preserves, protects, promotes and presents the ageless music of these artists for current and future generations to enjoy and appreciate using the technologies of the 21st Century. Rural Rhythm’s Sound Traditions collection titles have helped keep the traditional Bluegrass flame burning for decades and will continue the steady flow of available Old-Time Country, Bluegrass & Gospel titles culled from the treasure trove of masters in the Rural Rhythm Records vault.